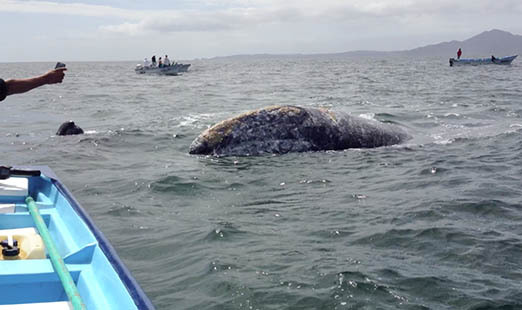 Which is how I ended up in a panga, slathered in sun block and high on Dramamine on a windy, stormy day, looking for whales. Our day started auspiciously enough or we just didn't look out the window. We got up at 5:00am to meet our guide Enrique at the restaurant downstairs at 7:00am. He arrived in white Wellingtons! Very cool. I liked the disco-Star Wars vibe- nothing like whale watching with a stylish boatman! 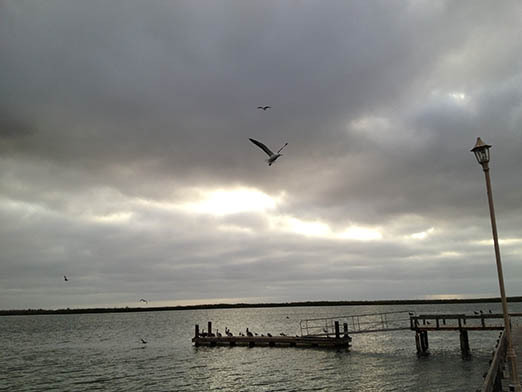 We said our hellos and he started to mumble - something about high tides, full moon, windy, stormy… Which all made sense when we got to the dock and saw how stormy and dark it was. There was absolutely NO SUN! In fact, it looked like it was going to rain any minute. But hey, what's one to do, we were there, so we just got in the boat. 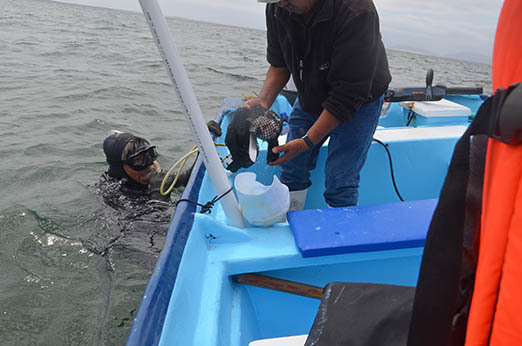 Enrique said he thought that conditions would improve when the tide changed, or he was just saying that as he looked at us - bundled up against the cold, hair whipping around our faces looking like reluctant air-sea rescue personnel. Well, it wasn't supposed to be windy and stormy. We just happened to pick the first day of bad weather all season. It was perfect the day before, bright and sunny, no wind, calm, and people were PETTING the babies! Ok, so we headed out. Enrique was still going to give us the full tour, so he took us to a series of mangrove inlets inhabited by resident and migratory sea birds. 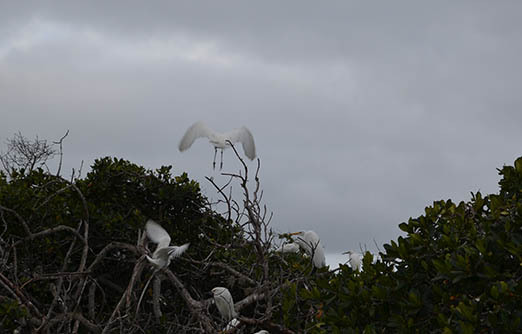 It was fun - we saw blue, white and yellow crown heron, Canada ducks, egrets, ibises. We took some shots but dreamed of a sunny day when they would be spectacular. After that calm interlude, we headed out into the bay. We tossed around in the wind and the waves- visions of Titanic - looking for whales. But they didn't like the weather any more than us. They were in a funk and hunkered down. Just like us humans, the bad weather depressed them. Our first sighting was a mother and calf moseying along, swimming and spraying. They didn't do anything fancy, but still, we were excited! We waited around for more, but the whales weren't cooperating. There we were with our 4 cameras, camera mounts, mini boom, new GoPro for underwater shots, and nothing to shoot! Finally, Enrique decided that we should wait it out with a coffee. On our way, we passed a couple of sand spits covered with thousands of cormorants. There were so many that the sand looked black. Hundreds would suddenly take off for another sand spit, flying fast and low in a single, continuous black line over the water. That was amazing and beautiful. A few decided it was too crowded. The restaurant was on a little island set up as a rest stop and lunch place. 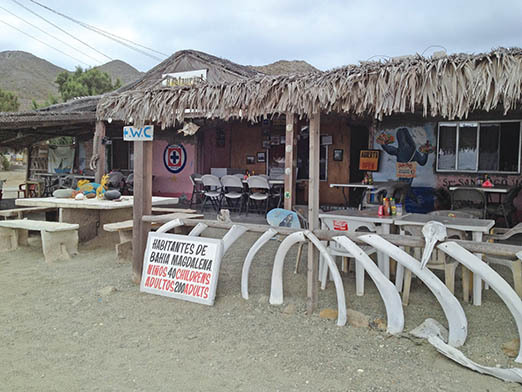 Just in case people forgot why they were there, it was decorated with piles of whale bones. While we were there, Enrique got on the phone with other boatmen and heard about a good place where there were lots of whales. Good coffee... but bones from dead whales? When we got there, we could see why. There actually was some sun shining through a break in the clouds. 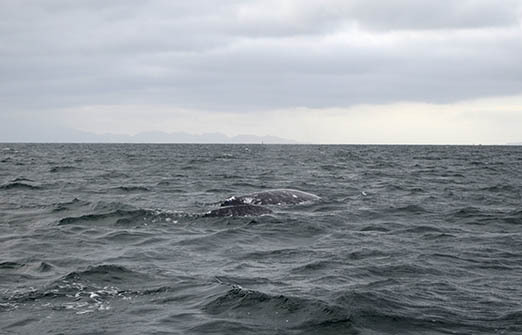 Unfortunately, along with the whales were other pangas with tourists, hushed and waiting for their photo-ops. At one point, there were 4 boats following and circling a lone female with her calf, which I thought was pretty bad. You'd think this was Brangelina! 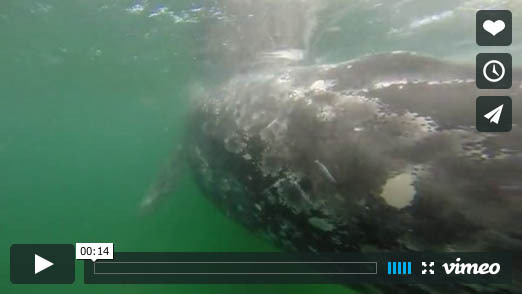 The whales were unfazed and ignored the paparazzi. Their moment in the sun, er, clouds. Whales getting papped. We headed out on our own and very quickly came upon other mother-child pairs. Thats when things really got exciting. 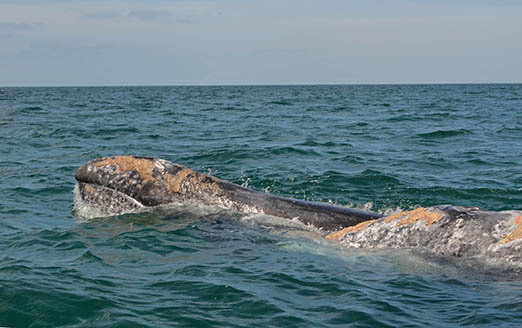 The whales got very close, coming up next to us and sometimes even swimming under our panga. You'd hear a funny snorting sound first- this was the whale breathing- and then, quite suddenly, they'd be upon you, the babies swimming close to their mothers. It was strange and awesome to look down and see this huge creature gliding underneath, close enough to reach down and touch it. We even had a couple fans, a crusty female covered with weird orange markings and her calf. They hung around quite a bit. The mother popped her head out of the water so we got a good look- definitely strange looking. Then there were the whales that rolled around in the water, which was fun. The babies never came over to say hello, and the big whales didn't breach or flip their tails. But that was ok. What we did see was already amazing. 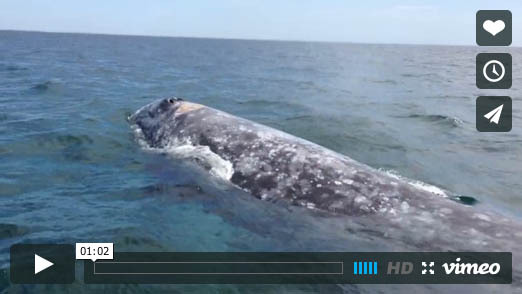 Scientists are divided about why whales jump out of the water. Some think it is to shake off barnacles. Others think it is an expression of joy. Which is what I like to think. On that dreary day, if they just wanted to stay indoors with a cup of tea, who could blame them? What I didn't appreciate was the poor light which hurt our photographs. And the water was so dark and turbulent- you should see what we got underwater with the GoPro! 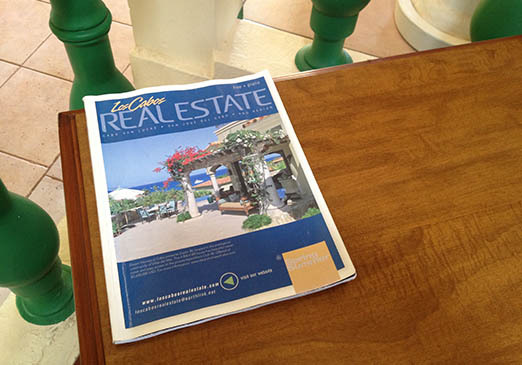 We had a nice surprise back at the hotel when we found a copy of Los Cabos Real Estate Magazine on a table. 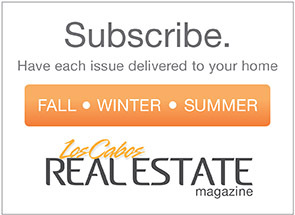 To think that our magazine made it all the way up to San Carlos! 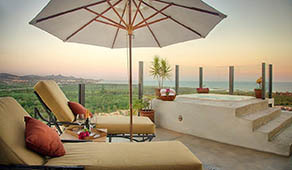 Next time, I must find out why our hotel, out there in a remote corner of Mexico's Baja Peninsula, is decorated in an Irish theme. Everything, and I mean everything, was Leprechauns and kelly green. The trim, the bedspreads, napkins, welcome mat- everything. quality which has its own appeal. The startling thing about it is this huge power plant just outside. It is the first thing you see as you arrive. There is also a big sardine industry there. But 4 canneries and more "efficient" fishing methods are wiping out all the fish. Reminds me of what happened to Monterey. 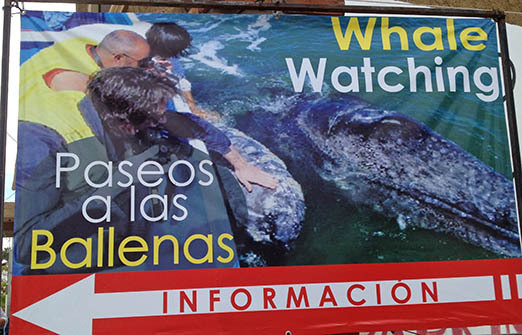 Right now though, the town, by all appearances, is focused on whales. You can't go anywhere and not be reminded. 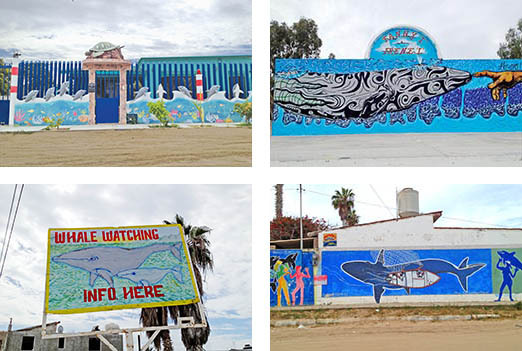 Murals, whale watching ads, the requisite whale skeleton at the entrance to town. We even found a house decorated in a happy whale motif. When we got back to Cabo, we stopped for tacos at Asi & Asado and ran into our friend who had the mystical experience at Mag Bay. We told her about our misadventures. "You went there to see whales? 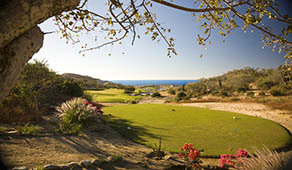 Why, there've been so many here in Cabo this year, I see them all the time from my place in Misiones! They jump out of the water, everything," she said with a yawn. Jeez, that sort of made us feel a little foolish, going all that way. No matter, we still had a great time, and NEXT year, with an almanac and tide table- watch out!